Is Amygdalin a Safe Cancer Treatment? Complementary and Alternative Cancer Treatments - Is Amygdalin a Safe Cancer Treatment? Amygdalin is a compound found in the pits or seeds of apricots, apples, peaches, plums, red cherries, and other fruits. It's also in bitter almonds. A partly man-made, purified form of amygdalin, known as Laetrile, was patented in the 1950s and became a popular alternative cancer treatment during the 1960s and '70s. It's now banned by the FDA and hasn't been available in the U.S. since 1980. Many websites tout the benefits of amygdalin (also called nitriloside, purasin, and vitamin B17) for cancer. Though these sites post stories of personal successes after using it, the scientific proof simply isn't there. The way your intestines break it down makes cyanide, which supposedly kills harmful cancer cells. Some people have also suggested that it teams up with enzymes in cancer cells to destroy them. Others say the cancer was caused because you didn't have enough "vitamin B17." But there's no proof that amygdalin acts like a vitamin in your body or that you even need it. Calling it a vitamin is a way to get around regulations for drugs. Animal and lab studies of amygdalin have mixed results. Several found no benefit, while others suggest the chemical has a slight effect on certain kinds of cancer cells. It might help relieve pain. To date, there haven't been any "controlled clinical trials" on amygdalin. This means scientists haven't compared people who receive the treatment to people who don't. The most obvious reason is that amygdalin can cause cyanide poisoning. Your blood pressure could drop very low, you may damage your liver, or you might go into a coma. In the worst-case scenario, high doses -- 50-60 apricot kernels, or 50 grams of Laetrile -- can kill you. These problems are usually worse when you swallow amygdalin rather than injecting it. Because amygdalin isn't FDA-approved, it could have dangerous ingredients. Products from Mexico, the main supplier of amygdalin, have been reported with bacteria and other harmful substances in them. Amygdalin is an unproven treatment that could hurt you. Talk to your doctor about any alternative or complementary therapy you think might help. Food Chemistry: "Amygdalin Content of Seeds, Kernels and Food Products Commercially-available in the UK." 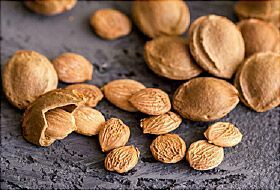 Journal of Agricultural and Food Chemistry: "Quantification of amygdalin in nonbitter, semibitter, and bitter almonds (Prunus dulcis) by UHPLC-(ESI)QqQ MS/MS." National Cancer Institute: "Laetrile/Amygdalin (PDQ®)–Patient Version: Overview," "Laetrile/Amygdalin (PDQ®)–Patient Version: Questions and Answers About Laetrile/Amygdalin." Memorial Sloan Kettering Cancer Center: "Amygdalin." Cancer Research UK: "Laetrile (amygdalin or vitamin B17)." CA: A Cancer Journal for Clinicians: "Laetrile: A Lesson in Cancer Quackery."